Engines by D. Rowan & Co. The second of three vessels named Bahadur to be built on the Clyde for the Asiatic Steam Navigation Company of London. The first SS Bahadur was built at the Scotstoun shipyard of Charles Connell & Company (Yard No 313) in 1907. 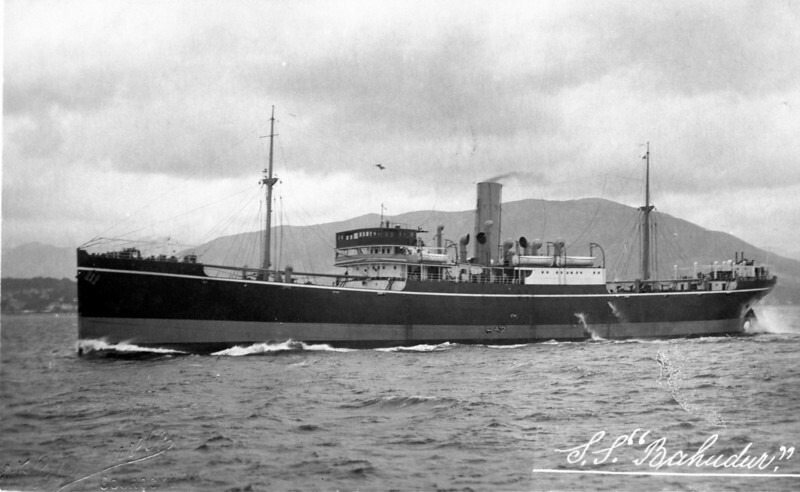 Twenty-two years later that vessel was replace by the first of two Lithgows-built vessels to carry the name. Bahadur (II) was the second of two sister ships delivered by Lithgows to the Asiatic S N Co in 1929, her sister being named Subadur. Both vessels continued to serve in the fleet until lost by enemy action in 1942 - first, Subadur was bombed and sunk in the Banka Strait by Japanese warplanes on 13th February then, just over 7 weeks later, on 7th April, Bahadur was torpedoed by a Japanese submarine. This picture shows Bahadur as a new ship proceeding to run speed trials on the Measured Mile off Skelmorlie on the Firth of Clyde. It was taken by the Gourock-based photographers William Robertson & Co, which firm was commissioned to make many photographic studies of new built ships by both the builders and owners. Robertson's work was highly regarded but strangely the message on the reverse side of this card gives the firms response to a complaint made by Lithgows about pictures supplied of another ship that they built in 1929 (see next picture).